Peripheral blood or whole blood carries the various blood cells, i.e., erythrocytes (red blood cells), leukocytes (white blood cells), and thrombocytes (platelets), suspended in blood plasma. Plasma consists mostly of water, but also contains proteins, glucose, ions, hormones, and clotting factors. Removing clotting factors from plasma generates serum. The most abundant cells in blood are red blood cells, which include hemoglobin, an iron-containing protein. Hemoglobin reversibly binds oxygen and thus facilitates its transport through the body. Thrombocytes have an important role in wound repair as they stop bleedings by clumping and clotting blood vessel injuries. Mammalian thrombocytes have no nucleus. They consist of portions of cytoplasm that are derived from megakaryocytes in the bone marrow before entering the blood circulation. Approximately 25–40% of platelets are stored in the spleen and released as needed, and the remainder circulate freely in the blood with a turnover of about ten days. Finally, the various subtypes of leukocytes play essential roles in the immune response. All cellular components of blood arise from hematopoietic stem cells (HSCs). Located in bone marrow, these pluripotent cells divide to produce specialized progenitor cells of more limited potential: common lymphoid progenitor cells and common myeloid progenitor cells. Common lymphoid progenitor cells give rise to T and B lymphocytes and natural killer (NK) cells, whereas common myeloid progenitor cells give rise to monocytes, dendritic cells, and granulocytes (including neutrophils, basophils, and eosinophils). Finally, erythrocytes, and thrombocyte-producing megakaryocytes arise from their respective common progenitor. Given their role in the immune response, leukocytes are of particular interest to understand mechanisms of health and disease and thus are commonly isolated from blood and blood products. Classification of leukocytes can be based on their origin (myeloid or lymphoid) or on the morphology of their nucleus (mononuclear or polynuclear) and the presence or absence of granules in their cytoplasm, which results in two groupings: i) peripheral blood mononuclear cells (PBMCs, also known as agranulocytes) and ii) polymorphonuclear leukocytes (PMNs, also known as granulocytes). Blood cells of myeloid and lymphoid lineages that arise from hematopoietic stem cells. 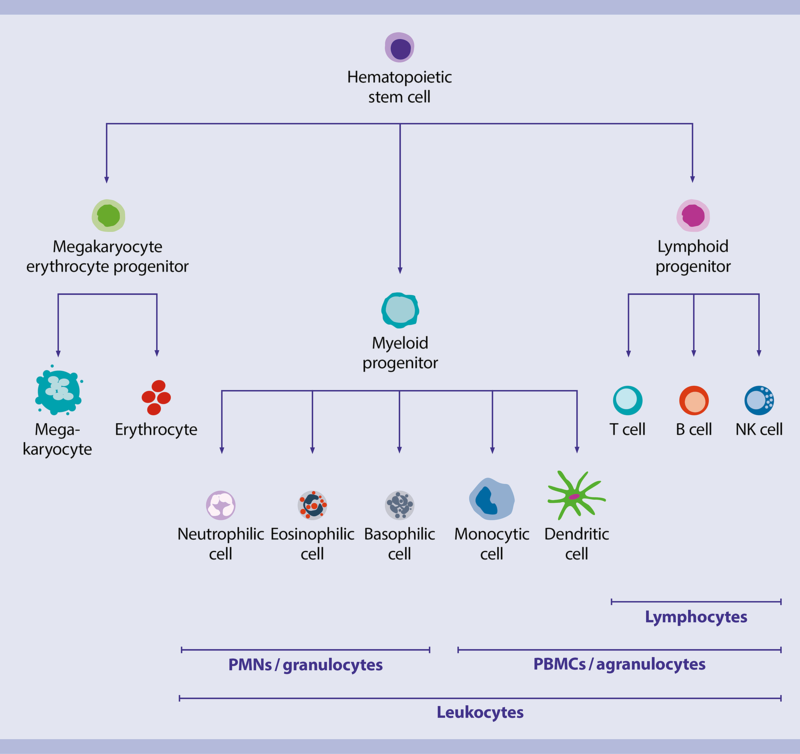 PBMCs include lymphocytes (T, B, and NK cells), monocytes, and dendritic cells. Among other characteristics, T and B lymphocytes are distinguished by their site of maturation and antigen receptors. T cells mature in the thymus and express the T cell receptor TCR, whereas B cells mature in bone marrow and carry the B cell receptor BCR. T cells are CD3+ and further classified into helper T cells (TH) that express CD4 and cytotoxic T cells (TC) that express CD8. B cells are characterized by CD19 expression and respond to pathogens by producing large quantities of antigen-specific antibodies to neutralize foreign objects like bacteria and viruses, and opsonize (mark) them for easy recognition by other immune cells. NK cells are CD56+CD3– and derive from the same progenitor cells as T and B cells, but lack antigen receptors. Finally, monocytes are the largest type of PBMCs and express CD14. They circulate in the bloodstream for 1–3 days and then typically move into tissues throughout the body where they can differentiate into macrophages and myeloid-lineage dendritic cells. Granulocytes are characterized by the presence of granules in their cytoplasm and a variable nucleus shape; hence the name polymorphonuclear leukocytes (PMNs). Neutrophils, eosinophils, and basophils are all granulocytes that release the contents of their prominent granules upon activation. Neutrophils are the most abundant leukocyte in blood and the first responders to a site of inflammation, where they exert their phagocytic function. Eosinophils (also known as acidophils) are thought to be involved in attacking multicellular parasites, such as worms. Basophils are associated with many specific inflammatory reactions, particularly those causing allergic symptoms. Basophils contain the anticoagulant heparin, which prevents blood from clotting too quickly, and the vasodilator histamine, which promotes blood flow to tissues. The most commonly used source for leukocytes is peripheral whole blood. However, blood products such as buffy coat, Leukocyte reduction system chambers (LRSC), and leukapheresis material such as Leukopak® are increasingly used as sources. For certain applications, especially stem cell research, cord blood and bone marrow are better suited as starting material. Cell numbers and composition differ between blood and the various blood products. As each application or research question has specific requirements with regard to cell numbers and composition, the source of leukocytes needs to be chosen accordingly. 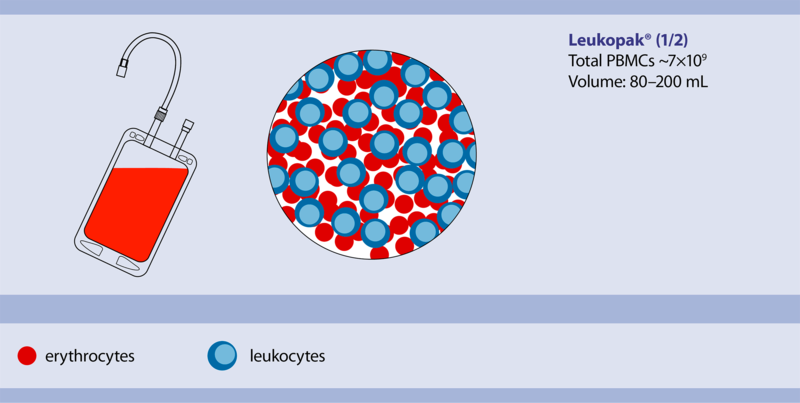 At a glance: average frequencies of total leukocytes in various blood products. Frequencies of cells were determined by flow cytometry using the 7-Color Immunophenotyping Kit, human; numbers of leukocytes and erythrocytes were determined by Sysmex® XP-300. Numbers indicate percentages ± standard deviation (n ≥ 10). All major immune cells can be found in the most natural condition in freshly drawn peripheral blood. However, a typical whole blood sample is rarely larger than 10 mL, and can often be smaller, particularly when the donor is a child. Larger volumes can be acquired from healthy donors, but usually no more than 500 mL are drawn per donation. This greatly limits the number of rare cells that can be obtained from whole blood. The advantage of whole blood as a source is the freshness of the material, which is essential for studying sensitive cells like neutrophils. Anticoagulants are commonly used in samples to prevent blood clotting. Heparin, ethylenediaminetetraacetic acid (EDTA), and citrate are among the most commonly used additives. Heparin binds to the enzyme inhibitor antithrombin III (AT), which results in a conformational change within the AT protein and ultimately in its activation. Activated AT inactivates thrombin, factor Xa, and other proteases involved in blood clotting. EDTA strongly and irreversibly chelates divalent cations such as Ca2+, thereby preventing blood from clotting. Finally, citrate is also used to bind Ca2+. Buffy coat is the fraction of a blood sample that contains white blood cells after removing erythrocytes and plasma. After blood donation, a 450-mL blood bag is centrifuged, resulting in three fractions: i) plasma (top fraction), ii) buffy coat (intermediate fraction), and ii) erythrocytes (bottom fraction). Generally, blood banks are only interested in plasma and erythrocytes. Therefore, those parts are extracted from the blood bag. The remaining material (buffy coat) consists of concentrated leukocytes with a reduced number of erythrocytes and granulocytes and varies in volume from 30 to 80 mL. Readily available and relatively inexpensive, buffy coats are a popular source of PBMCs. LRSC, also known as buffy cone, is the waste product of plateletpheresis, a process by which thrombocytes are separated and collected from drawn blood for later transfusion into patients with platelet-related disorders. The separated platelet fraction still contains leukocytes, which must be removed prior to platelet transfusion to prevent rejection problems. To that end, leukocytes are filtered out by leukoreduction and collected into an LRSC. Thus, the LRSC contains a high density of leukocytes with a low concentration of neutrophils. A good source for large quantities of leukocytes are commercially available Leukopaks®. This is an enriched leukapheresis product collected from peripheral blood and consisting of a variety of blood cells including monocytes, lymphocytes, and erythrocytes. 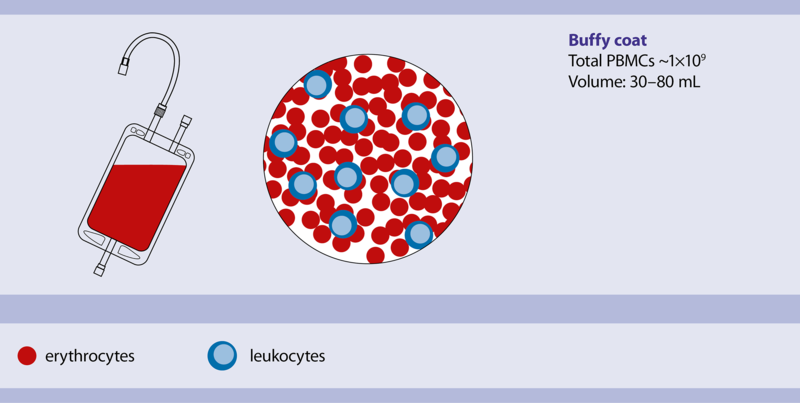 The ratio between leukocytes and erythrocytes is low (on average 1:1), as is the number of granulocytes. Commercial Leukopaks® are available in a few standard sizes, ranging from an entire Leukopak® to ½ and ¼ sizes. Although the number of PBMCs per Leukopak® is variable, it generally remains within a certain range. In some cases, donors are injected with G-CSF (granulocyte colony stimulating factor) to induce leukocyte production and trigger migration of stem cells from bone marrow into blood. Therefore, mobilized Leukopaks® have higher numbers of leukocytes compared to immobilized Leukopaks®, and frequencies of the various PBMC subtypes differ as well. Most Leukopaks® are from healthy donors, but it is also possible to request Leukopaks® for certain disease states, such as allergies and diabetes. Cord blood remains in placenta and umbilical cord after birth and is collected to harvest stem cells that can be used to treat hematopoietic and genetic disorders. Cord blood contains all components of whole blood, including leukocytes, and is also rich in CD34+ hematopoietic stem cells. Although the number of CD34+ cells varies greatly among individual donors, typically 1–4 million CD34+ cells can be collected per cord. Cord blood is used increasingly on an experimental basis as an alternative source of stem cells that are otherwise obtained from bone marrow. Bone marrow (BM) is a semi-solid tissue located in the cancellous parts of bones and is the main site of hematopoiesis. Besides marrow adipose tissue and supportive stromal cells, BM contains mesenchymal (MSCs) and hematopoietic stem cells (HSCs). HSCs give rise to the various blood cells, including leukocytes. MSCs differentiate into the cells found in skeletal tissues, including cartilage cells (chondrocytes), bone cells (osteoblasts), and fat cells (adipocytes). BM mononuclear cells (BM MNCs), which include leukocytes as well as stem and progenitor cells, are separated from erythrocytes and granulocytes by density gradient centrifugation. A protocol for the isolation of BM MNCs by density gradient centrifugation can be downloaded from the related resources panel to the right. Whole blood can be used directly for the isolation of target cells. In some cases, however, the isolation of a particular cell type can be more effective with PBMCs as starting material. PBMCs can be generated from whole blood by density gradient centrifugation or erythrocyte lysis, although the latter is considered only a “quick-and-dirty” method. Buffy coat, LRSCs, and Leukopaks® are also an appropriate basis for the generation of PBMCs. The most common density gradient centrifugation method uses Ficoll Paque®, a solution of high molecular weight sucrose polymers. A blood sample is centrifuged in a tube containing the density gradient medium to separate its components according to their densities. Erythrocytes have a higher density than plasma, and so become packed in the bottom of the tube to make up 45% of the total volume (in blood from healthy donors). This volume percentage is known as hematocrit. Leukocytes and platelets form a narrow buff-colored layer (buffy coat) immediately above the erythrocytes. Finally, plasma makes up just under 55% of the total volume and is a pale yellow fluid. The buffy coat contains lymphocytes, monocytes, and platelets and is harvested for two subsequent centrifugations in a buffered salt solution to wash the PBMCs and remove the platelets. The resulting PBMCs can be used for the isolation of cell subtypes or other experimental procedures. A protocol for the isolation of PBMCs from blood by density gradient centrifugation can be downloaded from the related resources panel to the right.